Recipe by: I Can't Believe its Not Butter! 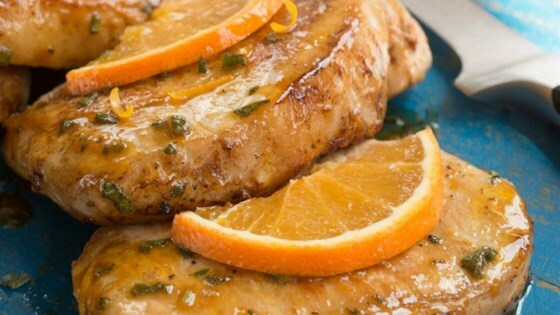 "This 'pork chop pick me up' adds a bright splash of citrus and warm sage to your weeknight dinner! We can all use a little spice!" Season chops with salt and cracked black pepper. Melt 1 tablespoon I Can't Believe It's Not Butter! (R) Spread in large nonstick skillet over medium-high heat and cook chops, turning once, until done, about 8 minutes. Meanwhile, grate 1 teaspoon peel and squeeze 1/4 cup juice from orange. Remove chops to serving platter and keep warm. TIP: For a delicious variation, substitute lime for the orange and cilantro for the sage! I really expected not to like this, but I chose the cilantro/lime instead of the orange /sage ones & I could not get enough of the citrusy /buttery flavor. I will definately be making this again. I will not bother making it again, it was on the dry side as pork so often is. These went together quickly and were very good. Followed the recipe exactly, just cooked a bit with the cover on so juices wouldn't dry up. Family liked them a lot. easy and great taste. p.s if your 21 or older the orange complements a blue moon beer.